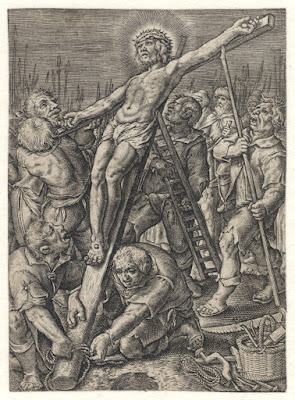 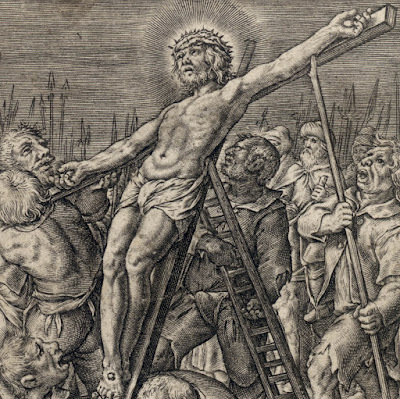 “The Raising of the Cross” (aka “Crucifixion” [Rijksmuseum title]), c1600, from the series, “The Passion of Christ” (aka “Passio Domini Nostri Iesv Christi”), designed and published by Hieronymus Wierix in Antwerp with privilege by Joachim de Buschere (secretary in the Council of Brabant). Engraving on fine laid paper trimmed to the image borderline (without the lines of text below the borderline) and backed on a support sheet. Loss of the text lines below the image borderline makes the task problematic in determining which of the four states this impression was taken. 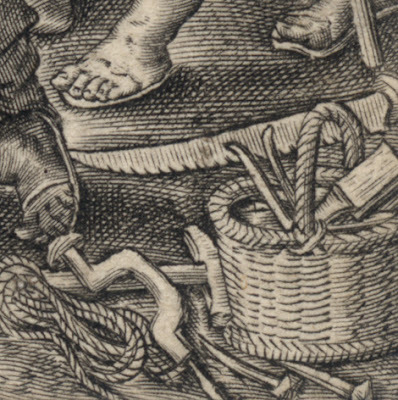 Nevertheless, based on the complete/full lines describing the top of the handle of the foreground basket, I assume that this impression is from the second state. 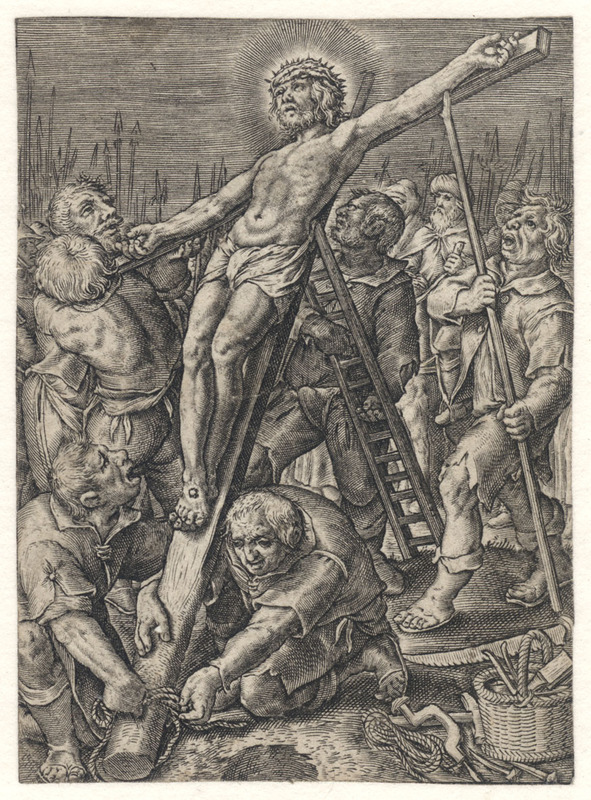 (Note, compare these unbroken lines with the broken lines in the same area of the impression held by the BM [1859,0709.3049] and the impression held by the Rijksmuseum [RP-P-1911-492]). 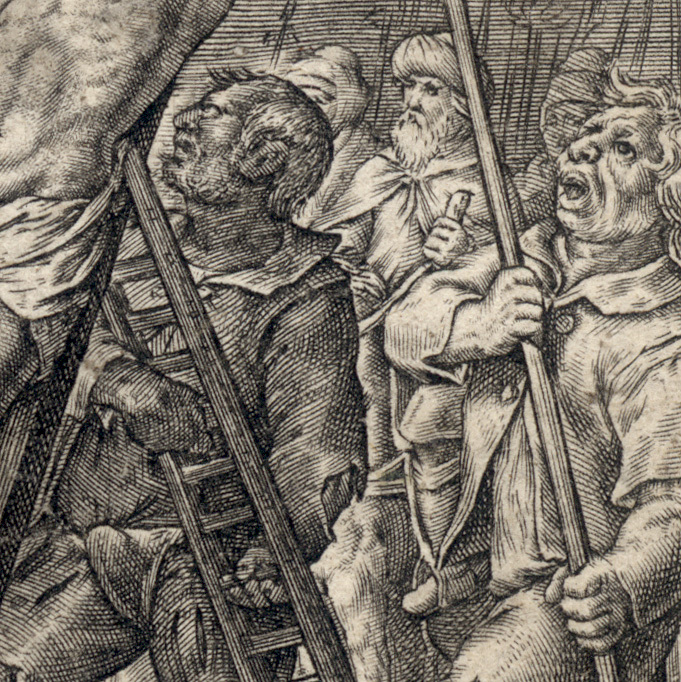 Beyond the treatment of these important lines, based on the crispness of the lines throughout the print that show no sign of wear to the printing plate, this is undoubtedly an early/lifetime impression. 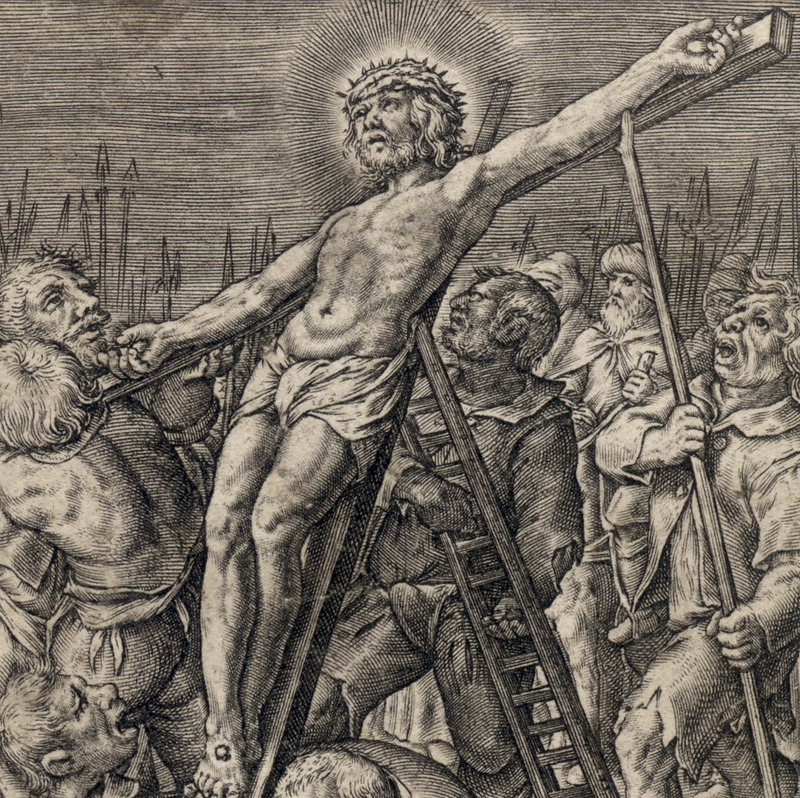 Condition: crisp, well-inked and well-printed early/lifetime impression trimmed to the image borderline (without the text lines below the borderline) and backed with a support sheet of archival (millennium quality) washi paper. 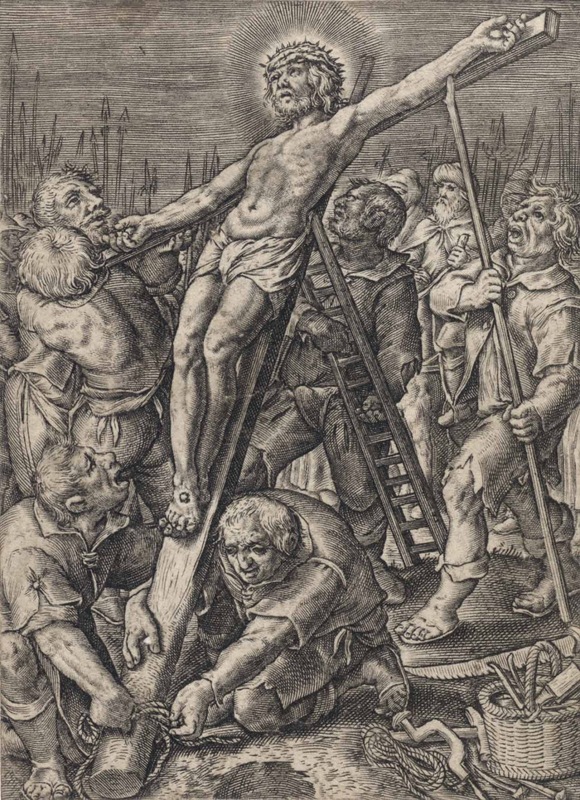 I am selling this very small and finely crafted engraving by one of the most important of the old master printmakers for AU$218 (currently US$164.70/EUR139.27122.74/GBP122.74 at the time of this listing) including postage and handling to anywhere in the world (but not, of course, any import duties/taxes imposed by some countries). 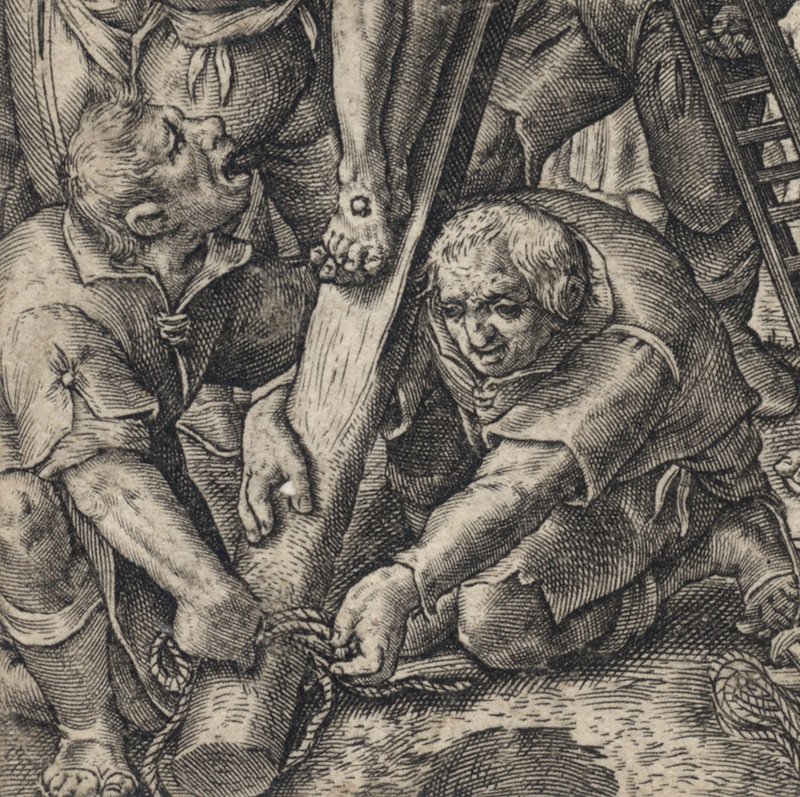 If you are interested in purchasing this spectacularly beautiful engraving exemplifying the love of lively rhythms and chiaroscuro lighting of the Mannerist period, please contact me (oz_jim@printsandprinciples.com) and I will send you a PayPal invoice to make the payment easy. Although the strong rhythms and theatrical lighting (termed “chiaroscuro”) in this engraving exemplify the Mannerist leanings of Hieronymus Wierix, what catches my eye is the subtlety of the artist’s approach in his use of rhythm and shading. 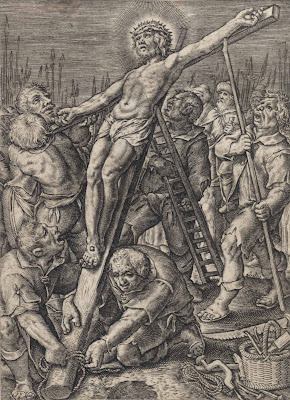 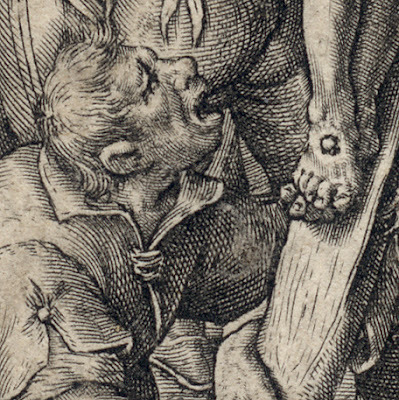 Note, for example, how the pointing angle created by the arms of the two figures at the foot of the cross help to visually “explain” that the cross is about to be lowered into the ground. Note also how the figure directly behind the cross is cast completely in shadow so that the viewer’s eye is drawn to Christ on the cross. 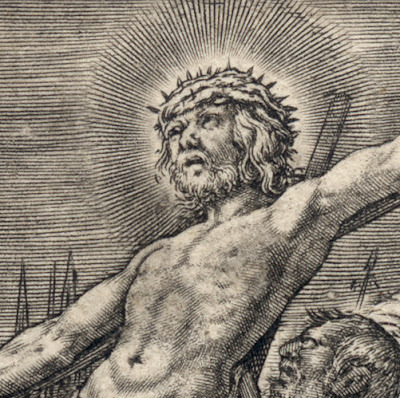 These examples may seem minor but when the approach of Hieronymus is compared to that of his brother, Johannes (see the earlier post and discussion about Johannes Wierix: http://www.printsandprinciples.com/2017/06/johannes-wierixs-engraving-christ.html), the subtleties of Hieronymus’ skills as an engraver become apparent.